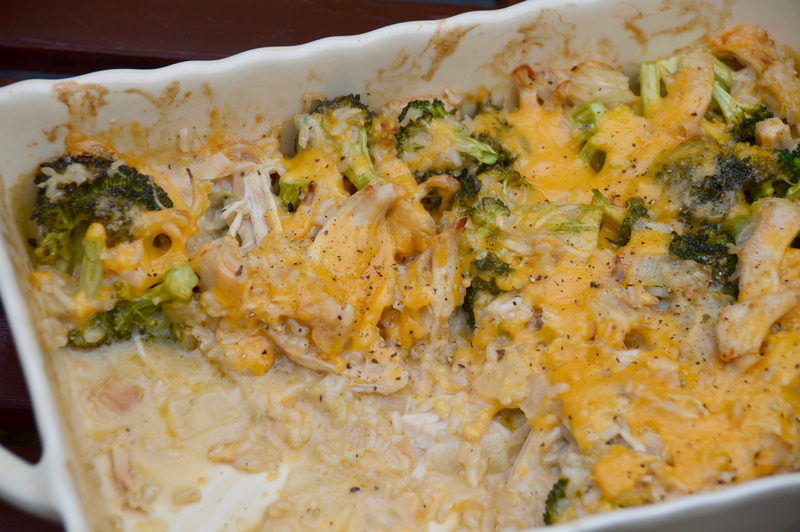 Juicy shredded chicken is mixed with rice, shredded cheddar and broccoli florets to create a wonderfully comforting and yummy meal. This is one of those recipes you make when you're craving something comforting, or you're in need of an easy low-maintenance meal for a busy weeknight. It's incredibly flavorful, cheap to make and so hard not to take a bite out of when it comes out of the oven. This recipe has been updated from my original to be creamier, cheesier and downright delicious! I'll serve this with a side salad and nothing else, and the leftovers are just as delicious. You can easily save time with this recipe by buying the frozen bags of brown rice from Trader Joes, or using an Uncle Ben's rice pouch, or utilizing those 10-minute brown rice bags from Whole Foods. Then it's just putting the ingredients together and baking until bubbly. As you know, I live in New England, and in October, that means casseroles and bakes start getting made, and the whole house starts to smell delicious all day long. Soups simmer on the stove, apple crisp bakes in the oven and quickly more time is spent socializing in the kitchen than on the deck like it did in the summertime. It's one of my favorite times of the year, and this is the perfect dish to serve when the nights get chilly. The cajun seasoning gives it just a slight kick of flavor. If you like more then add more cajun seasoning in during step 5. Heat the oven to 450 and place chicken breasts in a shallow baking dish. Season with a little cajun seasoning, then pour 1 C chicken broth over the chicken. Transfer to the oven and bake the chicken for 30 minutes or until fully cooked. Remove from the oven and shred with two forks, set aside. In a large skillet, heat about 1 TBS olive oil and add onions and garlic. Cook for about 3-5 minutes or until onions are translucent. Stir in chicken, broccoli florets and rice, then turn off the heat. In a saucepan, melt the butter then whisk in the flour. Once combined, slowly whisk in 2 C broth then the milk. Bring to a simmer and whisk slowly until the sauce has thickened, about 5-8 minutes. Pour the flour and butter roux over the rice mixture, adding 1.5 C of shredded cheddar in as well. Stir to combine and add more salt, pepper and/or cajun if needed. Pour everything into a large baking dish, then top with remaining cheese. Bake uncovered for 30 minutes, or until cheese is bubbling.